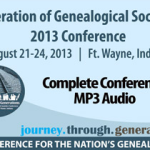 Just got word from Fleetwood Online that demand for the full conference recordings from the Federation of Genealogical Societies 2013 Journey through Generations conference has been so good that Fleetwood has extended the special during-conference price for an entire week after the conference concludes! That means you can get the audio recordings of the entire 136 or so sessions from the conference for the $299 during-conference price (instead of the after-conference price of $379) through next Saturday, August 31. The web page to order the entire CD-ROM set is now live, and you can get there through this link: Complete FGS 2013 Conference MP3 CD-ROM.